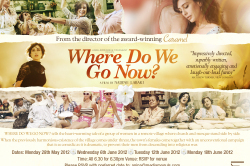 Winner of the People’s Choice Award at the 2011 Toronto Film Festival, Lebanese director Nadine Labaki’s Where Do We Go Now? (2011) is the long-awaited follow-up to her critically acclaimed debut Caramel (2007) which, like her latest offering, centres around the lives of Lebanese women. Whereas Caramel was set in the hustle and bustle of urban Beirut, Where Do We Go Now? takes place in a remote village, surrounded by land mines and enclosed from the outside world. This seclusion from the rest of society has created a unique environment in which Christians and Muslims live happily side by side, but when the villagers rig up an old television set and news of the religious conflict in the city filters through, the mutual tolerance between the two faiths begins to erode and it’s up to the women of the village to maintain the status quo. Where Do We Go Now’s strength lies in its premise, which gives Labaki licence to create a variety of amusing set-pieces based around the wily women’s attempts to placate their agitated menfolk. The seemingly random introduction of musical numbers will instantly put a few noses out of joint, whilst others will regard them as being part of the overall surreality. To be fair, it’s pretty obvious the director isn’t aiming for realism. Labaki satirises the absurdity of religion and the impact of mass hysteria but some critics have spat their dummies claiming it’s all a little too unbelievable to take seriously. Granted, the script does take a swan dive in quality when the comedy is brushed aside in favour of gloomy drama, but fortunately those scenes are brief and easy to forgive. Labaki’s effort falls slightly short of Nanni Moretti’s recent religious satire We have a Pope (2011) on an intellectual level, but Where Do We Go Now? is far more accessible for mainstream audiences and only the most cold of souls will not be charmed by this most modern moral parable.